Do you see a sick man lying on a bed with a friendly looking doctor standing by his bedside? Do you see a clinical setting of an engaging sketch of a doctor and a patient having an interaction? Do you see a funny appearing cartoon illustration? Let me tell you what I saw when I chose this as my book’s cover picture. I saw a funny appearing cartoon illustration of a doctor engaged in what appeared to be a friendly conversation with a patient. I knew this was the right cover picture because I believed that it would depict the funny cartoons in each chapter of my book that would help make it a reader-friendly book for all. At least, that was my view until I met an individual who challenged that view. About a year following the book’s official release, I proudly showed a gentleman the finished product of my hard work as I attempted to explain some of the book’s contents to him. While I was telling him details about the book, I noticed an intense look on his face as he asked me, “Now, why do you have to have white people on the cover?” A bit bewildered by that question, I truthfully said: “Oh, I didn’t even think much about that, I just thought that it was a very well-exemplified image of a clinician-patient interaction.” He appeared even more perplexed that I didn’t think about his stated view when I settled on this cover for the book. The solution, you ask? We must all make very conscious efforts to learn about one another’s interests in life. This does not always necessarily need to involve in-depth research about the existence of several cultures from prior centuries. That may just be too time-consuming. And who has that time in this current fast paced world? The real solution is rather simple. Talk more to people, text and email less. With genuine interest, an open heart and a lack of guile, find out who they are, what are their commitments? What are their interests and fears. As you do that, be open with them also about who you are. Even with our various life experiences and perspectives that are layered with such diversities, we all truly share the same perspective of the basic human need to love and be loved by others, to be respected, to not walk around with hearts that palpitate from unreal fears, to genuinely smile from our hearts and to raise children that are balanced and productive to the society. When we fail to truly open up and get to know one another, we exist with our own formed false perceptions of others, this builds anxiety which ultimately manifests as strange, unpleasant or even bizarre attitudes. My prayer is that we will all begin to make the necessary efforts to explore the valuable tools that will assist us in minimizing and overlooking our initial impression of others to ultimately empower us with the grace to choose a vision that is full of love, tenderness and compassion as we interact with one another in our diverse professional lives — clinicians and patients, teachers and students, law enforcement officials and community members. We must make every effort to rid ourselves of those unwarranted beliefs and prejudices that gradually rob us of the human qualities of kindness and compassion. We may not realize this, but such beliefs, with time, have the tendency to make us gradually become indifferent and stiff with hostility towards others who we perceive as different from us. It is imperative that we do better for ourselves and our future generations because life as we know it, can be quite fleeting. Nonye Aghanya is a nurse practitioner who blogs at her self-titled site, Nonye Aghanya. 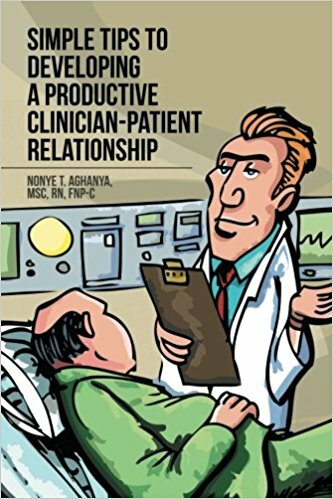 She is the author of Simple Tips To Developing A Productive Clinician-Patient Relationship. < Previous post Physicians put up walls. But they feel everything.